“The European Migrant Crisis, In One Image,” reads the headline of a Televisa story published in Mexico. The cover photo depicts the lifeless body of a three-year-old Syrian refugee in the arms of a Turkish police officer, who is carrying him off of a beach in Bodrum, Turkey. Images of the dead toddler, identified as Aylan Kurdi, are drawing attention to the ongoing refugee crisis that is challenging Europe. Aylan, his brother and his mother drowned when their ship capsized on the en route to Greece after they fled the civil war in their native country of Syria. At least 2,267 migrants have died trying to reach Europe the year alone, CNN reports as millions of migrants try to escape civil conflicts in the Middle East and Africa. 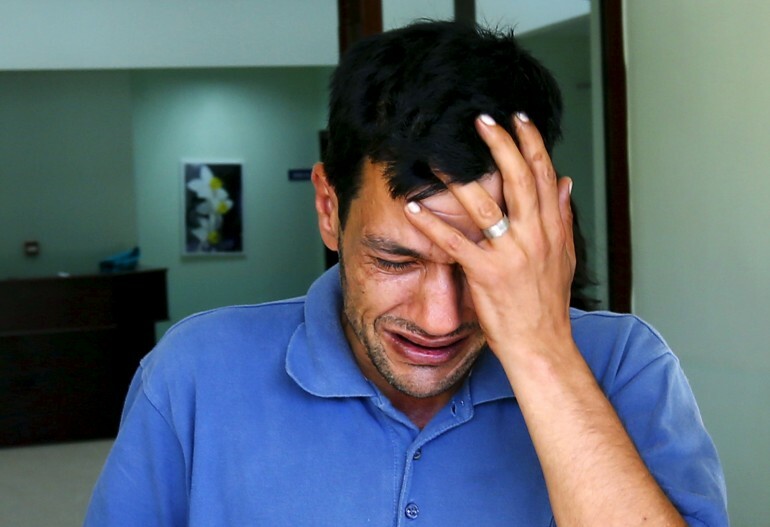 Latin American readers shared their reactions to images of Aylan Kurdi on Facebook and Twitter. Many expressed sympathy for the Aylan, often using religious language and bible quotes, referring to to the child “angelito,” meaning little angel or cherub. Others compared the Syrian migrant’s death on the route to Europe to those of Mexicans and Cubans trying to reach the U.S., as well as those of victims of drug cartel violence. In the quotes cited below, we’ve included the hometowns listed on the users’ social media accounts when available, but we could not verify the authenticity of those accounts. “How sad! It’s always these little angels of GOD that pay the consequences of adults,” wrote Luis Alexis Marquez Yendiz, of Caracas, Venezuela. “Forgive them Lord for they know not what they do!!!! Let this angel into your kingdom, amen,” wrote Jairo Martinez Grillito Perdónalos, of Nicaragua, invoking a prayer from the book of Luke, from the Christian Bible. “Borders shouldn’t exist : ( they just cause war and death,” wrote Kimberly Palma Vega of Guayacil, Ecuador. Ecuador fought a war with Peru in the 1990s over their Amazonian border. Ecuador’s neighbor, Colombia, is currently embroiled in a border dispute with Venezuela. “Cubans have fled their dictatorship for 50 years, and the Caribbean sea is a cemetery full of Cuban men, women, children... the people who are now [paying attention] to the [Syrian] dictatorship of Bashar al-Asad, they support the Castro brothers; that’s the injustice in the world,” wrote Juan Arsenio Valdés César, who did not publically list his location. Cubans and Cuban expatriots have expressed anger over the Obama administration’s decision to restore diplomatic relations with the Communist island nation. Many of Valdés César’s posts on social media criticize Communism and also the Muslim religion. “The same thing happens in Mexico with these people who pursue the American Dream which so few achieve,” wrote Oscar Adrian Hernandez Ceniceros of Nayarit, Mexico, about migrants who cross the dangerous U.S. border. The U.S. documented 307 deaths along the Mexican border in 2014, a 15-year low, according to the Huffington Post . “Publish the photos of what is happening in Mexico on a daily basis, and maybe they will have an impact as well,” wrote Amyn Jovany Dwalin Rivera Lázaro of D.F., Mexico. Her comment indluced an image of a corpse whose facial tissue had apparently been stripped off, revealing only bone and blood across the entire skull. While Televisa published the partially obscured image of the Syrian toddler, other outlets shose photos in which the baby appears lying face-down in the surf. One graphic image, posted by Reforma.com, filled the frame with the dead boy’s body. It was criticized by half a dozen replies and also retweeted about 50 times. “I still don’t understand why they put this these types of images, my God how morbid! It’s really painful to view this type of thing and for us as parents [...] it hurts and leaves us with a bad taste in our mouth. Don’t enrich yourselves with inappropriate pain, better to pray for these little angels in general and stop with these outrageous posts,” wrote Socci Ashley, or Cuernavaca, Mexico. *We're trying to confirm the name of the artist. If you recognize the signature, please let us know in the comments.